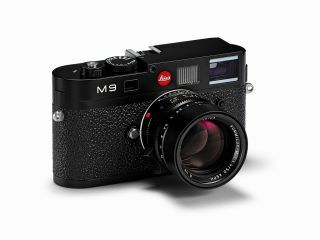 Leica has let slip details about its new rangefinder-style digital camera – the full-frame M9. There's been rumours flying around about this camera for a while now, so it's good to actually get something official from the company. Touted as the 'world's smallest full-frame sensor' camera, the M9 has a 24 x 36mm sensor, 18MP resolution and has dimensions identical to the M8 – despite the larger sensor. Leica is touting a number of new features with the camera, including quick access options. The release date for the camera is today and it comes in either black, with 'vulkanit' finish, or a version in steel-grey with classic leatherette finish. When it comes to price, well, there's no easy way to say this really. If you want the Leica M9 then you are going to have to pay through the nose for it. It will be retailing for, gulp, £4,850. While this is pricey, the company has launched a new store in Mayfair, so you can now pop on down to test out this retro-riffic camera before you flash a huge amount of cash. Go to Leica.co.uk for more details.